The history of the Winthrop Congregational Church truly begins with the formation, in the year 1818, of the first church ever organized in what is now the Town of Holbrook. However; its ancestry even precedes that date as the following facts reveal. The present towns of Randolph and Holbrook were originally a part of the Town of Braintree, being known as the "South Precinct" of that town. During the period 1727-1731 a church was organized, with a place of worship being built at what is now Crawford Square in Randolph. As what happens in many instances, the formation of a church parish becomes the prelude to the birth of a new independent town. This became the case with Randolph (including what is now Holbrook) which broke away from Braintree in 1793, the church becoming the "First Congregational Church of Randolph." In 1818, the residents of the east section of Randolph, deciding it was time to have their own church, petitioned the General Court to be set oft as a separate parish. Distance of travel to public worship and increase in population were the main reasons advanced. The First Church of Randolph opposed the petition claiming that it was "encroaching upon their rights by seceding from their engagements." They claimed that this, along with a new Baptist Church in Randolph, was "calculated to cut off and decoy numerous and respected branches of our society." The First Church of Braintree also opposed the petition, stating that, "the interests of religion will not be promoted by allowing any divisions." The opposing arguments had little weight with the General Court, both houses reporting favorably on the petition. On February 15, 1818, the act incorporating "a body politic and religious society by the name of the East Parish in Randolph, was passed. 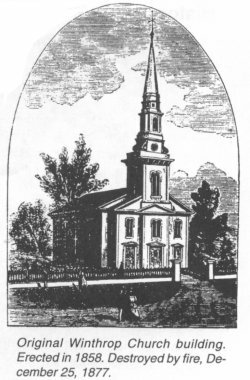 The "East Parish Church," otherwise known as the "Second Congregational Church of Randolph" was organized on December 15, 1818, its first pastor being the Rev. David Brigham. A year later a church building was erected which stood between the present Holbrook War Memorials and the present Holbrook Fire Station. (Its first janitor was Zenas French, Jr., in 1820 who received $15 a year.) In 1855, serious dissension's arose in the church, the basic cause, it is said, being a strong disagreement over a proposed change in the number of deacons. Also, there existed some related discontent with the pastor, Rev. Ezekiel Russell, D.D., who had been installed five years before. This unfortunate situation resulted into the formation on December 30,1856, of a new society named in honor of Gov. John Winthrop, first Governor of the Massachusetts Bay Colony. For a number of years, two Congregational churches stood less than a score of rods apart in East Randolph, each of their bells ringing each Sunday almost in competition. However, eventually the old "Second Church" gave way to the test of time. It closed its doors in 1864, some of its members attending the Winthrop Church, but not as members of the same. On February 29,1872, after a considerable legal battle in the General Court, East Randolph became the new Town of Holbrook. During that same year, after a serious disagreement with the Church, the Rev. Dr. Russell resigned as pastor of the Winthrop Church. As will be seen, this seemed to have initiated a new outlook and spirit in the Church. The Winthrop Church grew and prospered, however disaster struck early on Christmas morning, 1877, when fire completely destroyed both the church building and the nearby Holbrook Town Hall. This great conflagration remains the worst in the town's history. Strange as it might seem, this serious setback seemed to further unite the church. $15,790 was subscribed by members and friends toward rebuilding the church. On the evening of February 25,1880, a handsome new church (the present building) was dedicated. The total cost was $28,327. Although the house on North Franklin Street, opposite the Park, was built by Elisha Niles Holbrook in 1850 for Rev. Dr. Russell of the old "East Parish Church," the church itself never had a permanent parsonage until 1883 at which time Mary Wales Holbrook, daughter of Elisha Niles Holbrook, gave the present building to the church. An important feature of any church service is the Choir. The earliest known Chorister here was Capt. Ezra Thayer (the nation's first shoestring manufacturer) in 1819. In those early days, music was provided mainly by violins and bass viols and sometimes a flute, however later the organ was introduced probably at the Winthrop Church, with Elisha Wales Thayer as the first organist. The Paine and Thayer families were very prevalent in the Choir, and in recent years the Porter and Kierstead families. Societies, or Auxiliaries as they were originally called, have always played an important role in the well being of the Winthrop Church, both financial and social. The oldest, the "East Randolph Reading Charitable Society," was formed by a number of ladies in 1830, its purposes were to improve knowledge, promote social well being, and of fostering the spirit of benevolence and philanthropy. It existed to about 1863. The organization with the greatest longevity was the "Winthrop Female Benevolent Society" which was organized in 1857. Its primary objects were "the encouragement of giving, to induce the work of well doing by some action of their own hands, and laboring for these ends at home and abroad." It's first president was Mrs. Louisa B. Russell. Although reorganized a number of times, it continued until 1972. The "Maternal Association," formed in 1881, concerned itself with welfare of children of the parish, the first president being Mrs. Seth C. Sawyer. It lasted at least to 1898. In 1881, a number of ladies formed 'The Holbrook Winthrop Church Woman's Missionary Society." It's object was the collection of money for Missionary purposes, and the cultivation of a missionary spirit. The first president was Mrs. Herbert Loring, the pastor's wife. This probably merged with the Benevolent Society at a later date. The "Young People's Society of Christian Endeavor" was formed between 1883 and 1891. As to its purpose, the name speaks for itself. The name was shortened to "Christian Endeavor" after a few years. Frederick W. Blanchard was the president for a number of years. (He also served the church as Treasurer, Church Clerk and Deacon.) A Junior Christian Endeavor was formed between 1907 and 1918. Somewhat related to this was the Pilgrim Fellowship between 1935 and 1940 which soon became the Senior and Junior Fellowships. The "In-As-Much Circle of the King's Daughters" was organized in 1898 with Mrs. Nellie C. White as its first president. How long this organization remained is not known, however they were very active well into the 1930's and probably later. A very active organization of the church for many years, and still very much so, is the "Philomathic Club" (lovers of learning). First formed from a Sunday school class of young ladies in 1915 by Mabel Evans, daughter of the pastor, it was officially organized a year later with Elizabeth Platts as the first president and Lillian Holbrook as treasurer. Its object was to work for the church and socialize. The "Phillies," as they are popularly known, have conducted many fund raisers over the years: Card parties, food sales, auctions, rummage sales, style shows, suppers, church fairs, etc. Not only were large sums given to the church, but to other worthy projects such as the Visiting Nurse, TB Fund, and "Baskets for Shut-ins." The "Winthrop Men's Club," was formed sometime in the 1920's. It may have originated from the "Men's Bible Class" which existed in the early 1900's, however information is lacking. Among the members in 1932 were Louie Flye, George W. Porter, Sr., Roy Smith, Fred Kierstead, Fred Blanchard, Ben Johnson, Oscar Wilde, Harry Roberts, Tom Dykeman, Frank Holbrook, Frank Reed and others, all important figures in the church. In 1961, an attempt was made to reform a Men's Club (Men's Fellowship), with George Snow as president, however the interest did not continue. In 1932 another women's organization by the name of the "CoWorkers" was organized with Mrs. Wilhelmina Hollis apparently as the first president. She was followed by Mrs. Eva Smith with Helen Raynor as treasurer. This group probably descended from the "Willing Workers" which existed between about 1904 and 1915 with Sarah T. (Holbrook) Thayer as president. The purpose ot the Co-Workers was 'To be a friendly, happy group who enjoy meeting together to serve the church in any way called upon, and to aid the church financially." Over the years they have held cooked food sales, rummage sales, suppers for the Little League, American Legion and Harvest Festival. They provided refreshments for veterans at the Brockton V.A. Hospital. They are still an active group. The "Women's Association" existed for an unknown number of years. This organization was dissolved in 1944 and bec8me the "Committee of Women's Work." The "Winthrop Club" first formed late in 1941 with the encouragement of Rev. Joseph J. Russell. On or about February 1,1942, the Educational Committee organized this group of older young people which met in the vestry and organized as the "Winthrop Club." This proved to be one of the most active organizations in the church, meeting every Sunday evening. They became involved in many efforts, putting on suppers, plays, and sponsoring Harvest Festivals, the Boy Scout Troop and other activities. Their Minstrel Shows of the 1950's were great successes, not only performing locally, but in Veterans' Hospitals, etc. In 1943-44 the group disbanded due to losing members to the armed forces, however they re-organized in 1946 and continued to be active until 1980. There have been other organizations connected with the church such as the "Winthrop Associates", the "Winthrop Church League" and the "Hobby Group" and others, however most were short-lived. Of particular interest in our history is our close relationship with the Methodist Episcopal Church of this town. The first co-operative effort between the two denominations was the establishment of the "Chapel on the Hill." First organized on July 15,1878, at the home of Washington L. Bates (now the home of Geo. W. Porter, Jr.) at the intersection of Weymouth and Pine streets. By the following November the Chapel was completed on the opposite corner with a seating capacity of nearly 200, this being especially appreciated by people living in that part of town. Afternoon worship was held at 4 p.m. usually by a Deacon or Lay-Person. (Deacon Leonard Belcher, of the Winthrop Church, conducted many services there.) A small organ was placed in the building, early organists being Mattie Dean, Martha Damon and Annie Porter. 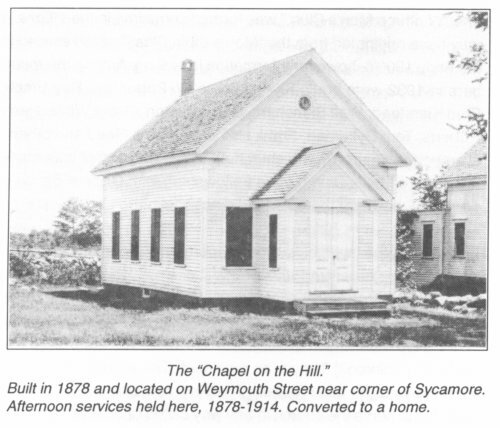 The Chapel continued to 1914 when it was closed, moved, and converted to a home on Pine Street. Union services between the Winthrop and Methodist churches were held during the summer months for many years. In October, 1931, committees from each church considered the union of the two churches. When it came to a vote, the proposition was passed by the Winthrop Church by a close vote, however the Methodists, who favored the idea, felt it should be by a two-thirds vote, and the matter was dropped. In 1966, the Winthrop Church invited the members of the Methodist Church to unite with them for services, said services to be in the Winthrop Church while the new Methodist Church building was being built. In 1991-1992, the Winthrop Church became a part of the Ecumenical Food Pantry which originally began at the Methodist Church. Through the efforts of the Holbrook Clergy Association, all five churches in town now take part.